(CNN) - The Office of the Special Counsel on Wednesday announced it was citing Secretary of Health and Human Services Kathleen Sebelius for illegally making political comments at an official event, which is a violation of the federal Hatch Act. The counsel found that she made the comments when delivering the keynote speech at the Human Rights Campaign Gala in February. After the apparent Hatch Act violation emerged, her office reclassified the trip from official to political and she reimbursed the government for associated expenses. The law prohibits most federal employees from "engaging in political activity while on duty," according to the special counsel, but some officials, such as cabinet secretaries, are permitted to make political statements in their personal capacity. The Office of Special Counsel is an independent government agency which can investigate and prosecute. The counsel found that "the Secretary departed from her prepared outline" when she told attendees at the event, "it's hugely important to make sure that we reelect the President and elect a Democratic governor here in North Carolina." In a seven-paragraph email to the special counsel's office, Sebelius concluded that "I regret making statements that converted my participation in the event from official to political. As I have also explained, keeping the roles straight can be a difficult task, particularly on mixed trips that involve both campaign and official stops on the same day. Since this incident, I have met with the ethics attorneys at the Department to ensure that I have an accurate understanding of what types of statements are prohibited at an official event." In her letter, Sebelius took issue with the special counsel pursuing the "minor" issue to this point, rather than considering it rectified when the trip was reclassified and expense repaid. "I believe that you should have concluded that any violation was corrected when the event was reclassified as political," she wrote. "I believe that you should have concluded that the consequence of my going 'off script' at an official event was to change the nature of my appearance for cost reimbursement purposes only." 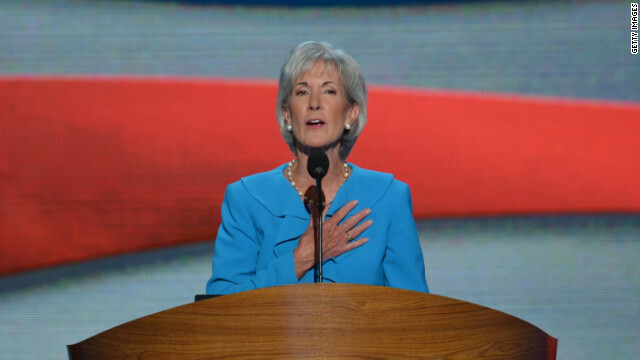 A HHS spokesman issued a statement which made no mention of the secretary's regret. "The U.S. Office of Special Counsel (OSC) released its findings today on extemporaneous remarks made by the Secretary on February 25, 2012 at a Human Rights Campaign (HRC) event," a statement from a HHS spokesman read. "As was previously announced and at the direction of the Secretary, the Department of Health and Human Services (HHS) reclassified the event as political and the U.S. Treasury was reimbursed for all travel expenses." The special counsel's report specifies that it now goes to Obama for "appropriate action." The Hatch Act should be modified to provide for stiff financial penalities for this behavior. Start with $25,000 per violation. Repeated violations, jail time. Put some teeth into these laws otherwise they are a JOKE. Please detail the "high crimes and misdemeanors" that justify your demand. Go ahead. We could all use a laugh. It is NOT "taxpayer money" once it is paid to an employee as their salary. Dues come from salaries and wages, not directly out of the government's coffers. Those peopel EARNED that money. IT IS THEIRS, NOT YOURS. You're as bad as the giant corporations and millionaires who own them that never stop thinking of their employees' salaries as still their money...and resenting every red cent they have to pay in exchange for the labor. They should call it the Hack Law because it is intended to discourage elected officials from being Political Hacks while on official business. Of course, the Obama Administration would complain that this is directed specifically at them and I would agree. Mitt Romney and Paul Ryan handing out sandwiches in Wisconsin(?) on primary election day was a far worse violation. Such venom. Where is the outrage over voter suppression? >Voice Crying In the Wilderness - Where is the outrage over voter suppression? you expect outrage for something that isn't happening, except in the minds of looney leftists??? where are all the press reports of this happening? the left owns the msm so it would be all over the airwaves and newspapers if it was happening. All the phoney outrage is transparent. to any reasonably thinking human being...considering that when informed that she violated the "Hatch Act" the HHS secretary "reclassified the trip into the proper category"...and then "repaid all associated expenses" as to not have it tax payer funded...then she consulted with the "ethics attornys" at the department to ensure that she would not in the future make such a mistake...any reasonable person would see this as a potential problem that has been properly addressed. If she had a history of making the same mistake over and over again...then yes run it up the chain...if she ignored the findings and took no action to remediate the issue then yes...run it up the chain...but considering what she had done to address the problem...this to me looks like nothing but a witch hunt. She took all the necessary steps to correct the issue and ensure that she doesn't repeat the issue at future events, and she had no history of repeated violations of the act. Anybody can see what's really going on here. At least the DEMOCRATIC Special Council isn't afraid to reprimand one of their own. Had this been a rethug during a rethug regime, he/she would have been feted for standing up for their party and principles and the dems would be told to "get over it". She's a progressive liberal.., what's the problem? Its not like she's campaigning for Romney. Is this the same lady who helped force THE NEW AFFORDABLE HEALTHCARE [[[TAX]]] Down our throat's??? Well, it looks like the persuit of Kathryn Sebelius is paying off! Already I'm hearing the anti-Obama chanting! The reason this incident has become an issue is because Sebelius is "hugely" a thorn in the GOTP's side, advocating for contraceptives, increased medicaid & Obamacare! This would never be on any1's radar except... it's Sebelius! No appology, only a resignation accepted from her & now they're calling on Obama to reprimand her, just to be able to say the excact anti-Obama rhetoric I'm reading here today! Some say Obama is the worst president we've ever had; the GOTP propaganda machine is doing it's job, inducing selective amnesia if people have already forgotten Bush Jr. He & his crew devastated us & just walked away w/a smile & a wave, leaving us holding the bag! We're still slowly (thank's GOTP!) digging our way out! He was the Worst & will be for a long time to come! Forward-Obama Nov.6! !